Fred and Ginger. Abbott and Costello. Cheech and Chong. Famous pairings have flourished throughout history, and it’s a proud person who can put their finger down and say, “I was there when it started. I remember the beginning.” So as you sit in your comfy little chairs surfing the web, take a moment in breathe deeply and commit to memory this moment in history. 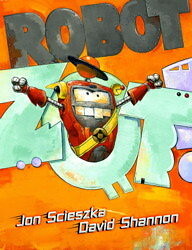 When Jon Scieszka and David Shannon made a picture book together at last. Oh, I know they’ve worked together before. But the Trucktown series, while sure to ably subdue any truck obsessed ankle biter you encounter, is the work not just of Scieszka and Shannon but a host of other talented fellas as well. So I’ve always kind of suspected that if you separated Shannon and Scieszka from the pack and isolated them for a specific amount of time they might, just might, be able to come up with something really cool. Enter Robot Zot. He’s brave. He’s determined. He fits snugly in the palm of your hand and he’s about mark the first instance of a Shannon/Scieszka solo pairing. Can you feel the love? The heart of a lion. The eloquence of a Tarzan. The body of a mildly rusted cell phone. “Robot Zot – Wham Bot! 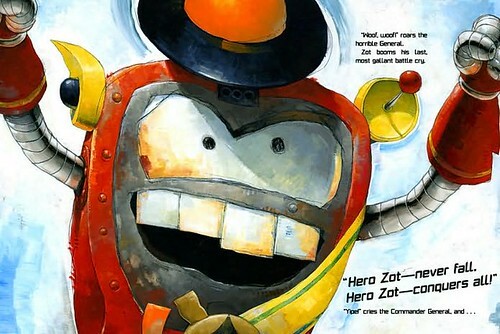 Robot Zot – Bam Bot!” Robot Zot has come to earth and he is intent upon invading. “No one stop Robot Zot. Robot Zot crush lot.” That’s how he talks. After crash landing in a backyard, by the time Zot’s standing in the kitchen with his phaser in hand it’s pretty clear that he’s not much bigger than a dustpan. And around every corner lurk enemies. Dispatching the appliances and television one by one (“He is glorious. He stands victorious.”) Zot meets a small cell phone toy that, by his reckoning, is clearly The Queen of All Earth. It’s love at first sight. A daring rescue ensues, but before he is able to leave Zot will have to face his toughest enemy of all. Zot works because he’s very much that small boy play acting heroism while causing mild to extensive damage around a home. Zot has no peripheral vision. What he wants he goes for, and he gets to be the hero of his own story too. I like that Scieszka makes it pretty clear that whenever you hear extensive praise of Zot (“Robot Zot – Hot Bot!”) it’s in quotations. Meaning he’s saying it about himself. Meaning he’s narrating the epic saga of his own life. Zot’s every little kid who has ever imagined that the kitchen, living room, bedroom, and backyard contained whole unseen worlds where threats and dangers lurked around every corner. Who will save us all? The littlest guy, that’s who! Illustrator David Shannon is best known at this point in time for his David series. In those books he let his thick paints and loose style conjure up the sheer chaotic madness that hides within each determined little boy. Robot Zot also has this free, loose, wild energy but it goes a slightly different route. Since we are dealing with a determined little robot, Shannon takes advantage of that great metal equalizer: rust. It’s everywhere. 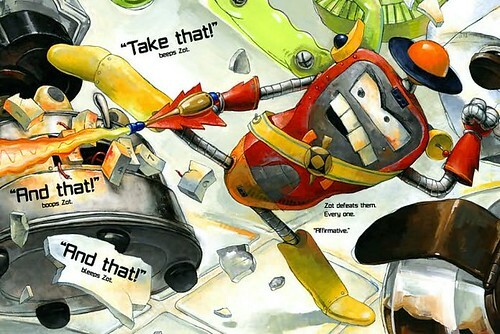 On the cover you can see the paint on the words “Robot” and “Zot” looks like it has been scraped off a little, revealing shiny silver metal beneath. Thick paints are crosshatched to reveal bald spots on Zot’s armor. Best of all, that idea of a little boy playing that you get from Sciezka’s words is perfectly replicated in Shannon’s imagining of Zot. Zot is basically David, only a little older, a little smaller, and with rectangular teeth rather than triangles. Uneven front teeth. Who in their right mind would ever imagine the comic possibilities of uneven front teeth? They’re what keep Zot from ever looking all that competent. Really, the moment when he seems in the most control is when you’re viewing him from the back. Otherwise the teeth are conveying to you the fact that in spite of his manly stance, this little robot hasn’t a clue what he’s doing. From the replica of what appears to be Saturn balancing on his head to his oddly sympathetic little expressions, Shannon has this character well in hand. When he sees “the Queen” for the first time Zot’s knees lock, causing his feet to turn inward in that jolt of first love. When he’s scared, his already wobbly knees grow tighter together and his uneven teeth sort of hang over an open mouth. It’s funny that you can instantly feel so sympathetic towards a guy who, not three pages before, was blowing up and knocking down every innocent appliance in sight. In the art of this book Shannon invokes all kinds of classic space comics and sci-fi flicks. Zot mimics a classic villainous pose when he stands gazing down upon the puny earth, mere moments before he has it in his grasp. I suppose that with his early super villain-like status it’s even more amusing that (A) he is pocket-sized and (B) he in fact is the hero of this story. At the same time, I was impressed by the silent two page spreads, different angles on the story, and moments when all you can see are exploding television sets, our heroes nowhere in sight. The images here are a shot of adrenaline to the eyeballs. Never stopping, never resting, always funny, always fine. Shannon works in some nice visual gags as well. Best Pal Bot, the sidekick and observer of Zot’s suburban carnage, is in almost every scene and is well worth seeking out. I am thinking of the moment when Zot leaps to attack a blender, eggbeater, and coffee pot. Best Pal Bot looks at the reader, eyelids closed enough to give us a kind of “Oh, really?” look. There are lots of little moments like this. In fact the final gag is so subtle that it could easily take ten to twenty readings before a parent figures out what Shannon’s done. At first it seems as if Zot, Bot, and Princess are flying against a star-studded night, a yellow moon nearby. Next shot, they’ve crashed into a cantaloupe truck. That nighttime sky was just a painting, and the Attack Ship is now firmly lodged in the center of a couple of very broken and evidently juicy cantaloupes. All this is well and good, but what I really want in a picture book is something I can read aloud to a room of shrieking preschoolers. Something that is gonna hook ‘em, grab ‘em by the nose, and not let go until I’ve stopped talking. I need a book that gives the old one-two punch. ONE – The words are bouncy, rhythmic, and allow me to do a couple silly voices if I want to (caveman/Frankenstein speech patterns are welcome). TWO – The folks I’m reading this book to can see it across a room. Big colors, bright pages, but with enough action and adventure to shake up the angles and views when at all possible. 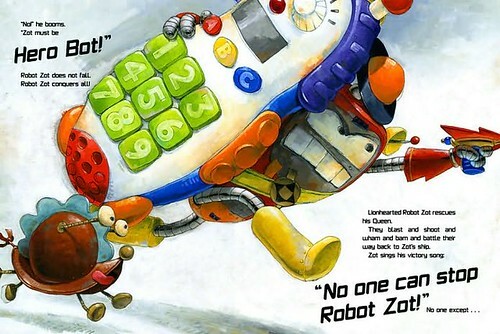 Needless to say, I’m not exactly left wanting after reading Robot Zot. Sort of born to be performed, this book. Notes on the Cover: Someone pointed out to me that it’s actually hard to figure out that the title of the book is more than just the word "Robot" when you look at it. Zot’s heroically pursting through the third "O" of his name, which is great except it’s hard to identify what the book is called. I think we’ll be seeing a fair amount of parents and kids coming into the library asking for that new picture book "Robot". A word of warning to the wise. Spotted: David Shannon usually hides a small white dog in his book (unless that book is actually ABOUT a small white dog). Can you find the one in this book? It’s tiny, but it’s definitely there. Indeed, put me on the list as one who has been waiting on a book by this duo themselves…and from the sounds of your review I will not be disappointed! To quote a famous librarian: Me want! This book will NEVER be on the shelf! Cannot wait. Reading this blog is a serious exercise in delayed gratification. Whatever am I to do with my overwhelming need to go acquire this book immediately? I suggest taking one’s own cell phone and parading it around the kitchen. That’s pretty much what I’ve been doing ad nauseum since reading this book.